When Joe Bragg calls crappie fishing a lifesaver, he isn’t exaggerating. After returning from two tours of duty in Iraq with the Army several years ago, his life hit rock bottom. His wife left him, he lost his house, he couldn’t find a job and the effects of post-traumatic stress disorder were taking its toll. “I was ready to check out. I was thinking suicide,” said Bragg, 37, who lives in Topeka, Kansas. “It was such a hard adjustment, coming back from the war. You don’t realize how much you change. Bragg served in the Army from October 2006 to July 2013 and put in two one-year tours of duty on an Army scout team in Baghdad. Serving in a war can be tough on a man, he’ll tell you. He witnessed horrors that he wouldn’t wish on anyone. He survived mortar fire 17 times (yes, he remembers the exact number) and lived with the pain of losing three friends to suicide. When water temperature drops into the high 30s at Kansas reservoirs, Joe Bragg piles on the clothes and goes crappie fishing. It’s one of the best times of year to catch big fish. These two crappie were part of his limit catch on a cold December day in eastern Kansas. But Bragg found hope in the most unlikely of situations. On some of many sleepless nights, he tried to get his mind off his recent past by staying up and tying crappies jigs. He drew on the experience of watching his father, who tied jigs while they lived in Florida. So he went to the big-box outdoors stores and bought an assortment of feathers, chenille and Flashabou in bright colors and went to work. Soon, he was casting his hand-tied lures into the murky waters of Kansas reservoirs and catching big crappies. He didn’t think much about his homemade lures until he started giving some of the feather jigs to friends and finding that they too, found success with the baits. As his jigs became in demand, he started charging for them. And suddenly, he had a reason for living. Joe Bragg ties the size and colors of jigs that are the “hot bite” for the lake he is fishing. 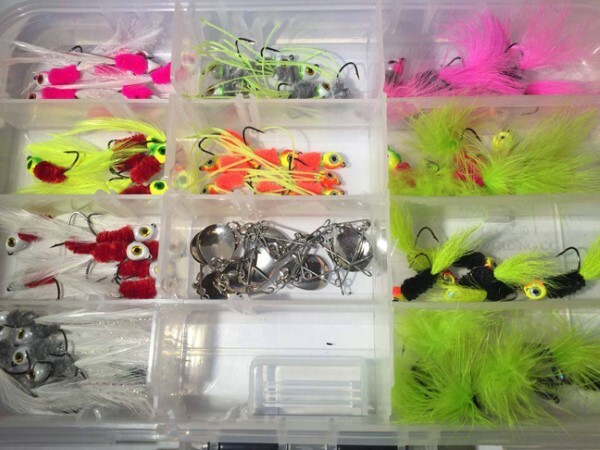 “I started tying jigs so that I didn’t have to sit somewhere begging for money,” Bragg said. “It was that bad. 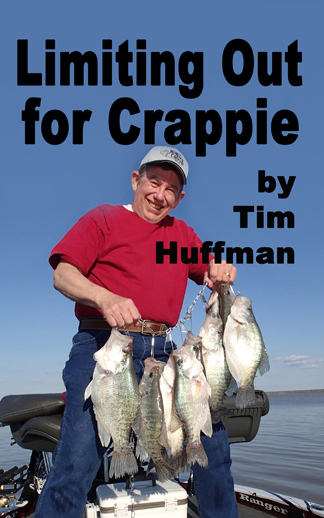 Yet, his life is much better now, thanks to the therapy of crappie fishing. He started a business in 2015 and began selling his jigs to fishermen across the country. He did business the old-fashioned ways, hand-tying each jig and taking custom orders. Purple, white and chartreuse? No problem. Bragg tied them up and usually had them in the mail to the customer in 36 hours. Flooded trees are a good place to use vertical jigging. Hillsdale Lake in December provided good action and a limit of crappie. But it wasn’t too long before Bragg had to back off. He tried hiring other Army vets to help him tie his jigs, but he still couldn’t keep up with demand. Today, he still ties jigs and sells them to friends. And he often ties a fresh batch the night before he plans to hit one of his favorite lakes in Kansas. A few minutes later, his boat was plowing through whitecaps on Hillsdale Lake, a 9,045-acre reservoir near Kansas City, headed to a spot he had located on a contour map the night before. Once Bragg turned on his electronics, the advanced sonar unit etched a pretty picture. There was brush 17 feet below the boat, and plenty of fish activity there, too. Bragg dropped one of his homemade jigs into the water and watched as it descended on his sonar screen. He stopped it just above the brush and held it steady. Seconds later, he watched as a mark on the screen streaked up to the jig, and he braced for a strike. This one hit. Bragg set the hook, and lifted a big crappie into the boat with his 10-foot jigging pole. 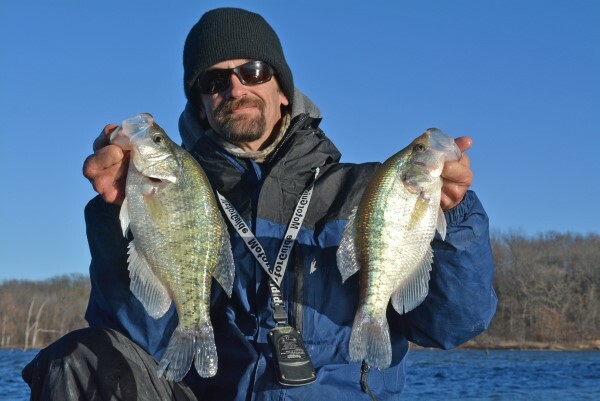 Joe Bragg has become a year-round crappie fisherman in Kansas. As long as there is open water, he’ll be out there. 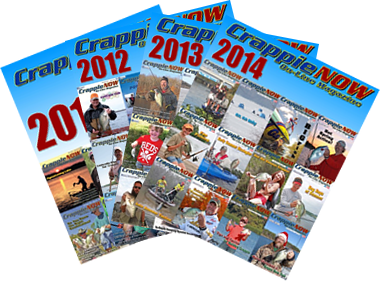 Here are some of the ways he catches crappies. 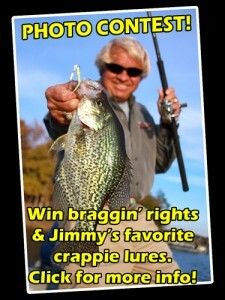 • You’ll seldom see Bragg casting for crappies. He almost always is fishing vertically, usually in 14 to 18 feet of water in brush. 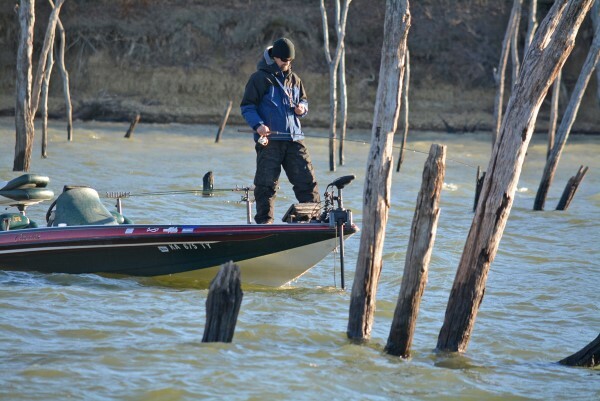 • One of his favorite times of the year to fish for Kansas crappies is in the cold of winter. The fish often gather in brush along river and creek channels and can readily be caught. Bragg likes to fish with 8- to 10-pound Power Pro braided line and one-quarter-ounce feather jigs that he hand-ties. Those jigs can be as much as 3 inches long, but the crappies will pound them, he said. • Bragg relies on high-definition Humminbird sonar units to pick up fish in the brush. He can watch his jig descend and can even spot crappies rise out of the brush to take a look at his offering. He uses a MotorGuide Xi5 wireless trolling motor that operates with a hand-held remote and a GPS module that he can program to act as an electronic anchor, holding him one spot. 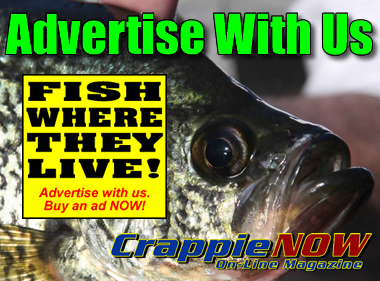 • During the summer months, he uses several methods to catch crappies. He often uses a drop-shot rig to lower minnows into the heart of the brush. He also spider rigs, putting out several long rods and minnows to present multiple baits. And when the daytime heat becomes oppressive, he will fish at night under the glow of lanterns or floating lights. The light sets up a food chain, attracting the bugs, then the minnows or shad, then a layer of crappies underneath them. That fish was the first of many keepers. Several hours later, Bragg and I had both caught our limit of 20 crappies and Bragg was again extolling the fun of Kansas crappie fishing. “The thing I love about crappie fishing is that you get a lot of action and you can eat what you catch,” he said. “You keep a bass to eat and you’ll get crucified. Today, crappie fishing is Bragg’s life. He stays busy running the Kansas Crappie Club, which he founded in October of 2015. At first, it was just a friends’ group on Facebook, a way to exchange fishing reports and get together for small tournaments. But it has grown to so much more. Today, the Kansas Crappie Club has 1,025 members and a small percentage of members get together for tournaments each month. Bragg earmarks a charity for each of the events he puts on, not even taking a cent for himself. Last year, his tournaments benefitted Toys for Tots, Heroes on the Water, the Beverly Woods Fishing and Hunting with Kids Foundation and local chapters of Ducks Unlimited, the National Wild Turkey Federation and the Quail and Upland Wildlife Federation. He also holds a tournament on Veterans Day to benefit a Kansas Department of Wildlife, Parks and Tourism program to buy fishing and hunting licenses for disabled veterans. When Bragg isn’t organizing a tournament or tying jigs, he often is on the water. He is a die-hard, fishing reservoirs and small state fishing lakes from the heat of summer to the bitter cold of winter. It’s all about the chase, and Bragg greets every day with enthusiasm. Bragg dreams of one day becoming a guide and competing on the national circuit. Until then, though, he is happy where life’s path has brought him. “Years ago, I never would have dreamed I would be doing what I am now,” Bragg said. “I’m happy when I’m fishing.